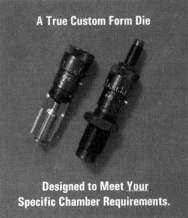 The Die's Sizing Insert is Custom Bored to Resize Your Fired Case to Optimimum Chambring Dimensions... Eliminating Excessive Stretching and Stress. We Use One of Your Fired Rounds to Determine the Correct Finished Dimensions. Uniform Headspace Maintained with Our Combined Sizing/Shoulder Bump Bushing. .050" of Adjustment per Revolution of the Micro-Dial. Each Engraved Increment Line Equals .00125" (1-1/4 Thousand). Our Die Will Not Scratch Your Cases... it Rockwell's out at 60-62.